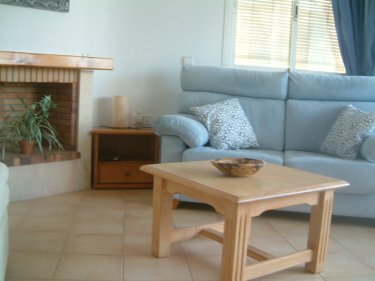 Lounge area with sofa and arm-chairs, satellite TV/Video/DVD/CD player. The fully fitted kitchen with granite worksurfaces has everything you would need to self-cater including a dishwasher. There is also a fully tiled bathroom and a twin-bedded room with fitted wardrobe on the ground floor. There is a large patio door leading from the lounge/dining room onto a covered furnished terrace, a lovely position to either escape the midday sun or spend a relaxing evening watching the sun go down. The steps from the terrace lead to the south-facing paved garden - a great spot for sun-worshippers who can relax on the sunloungers! The outdoor furniture seats 6 comfortably. Upstairs are 2 further bedrooms, the main south-facing bedroom has a double-bed and fitted wardrobes with it's own south-facing terrace and the second bedroom has bunk-beds, fitted wardrobe and a larger north-facing terrace. The fully-tiled bathroom completes the upstairs. The communal pool is just a minute's walk away. It is shared by only 17 houses, most of which are privately owned holiday homes, therefore it is rarely busy even during summer holidays. There are ceiling fans throughout and central heating. Apologies for the poor quality photos, they don't do the house justice. SPECIAL OFFER: 6 - 20 September 2014 - only �400 per week!! 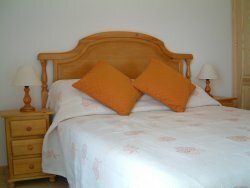 THE RATES QUOTED ARE FOR HOLIDAY LETS NOT LONG TERM. PLEASE E-MAIL FOR LONG LET RATES.